People visiting Los Angeles for the first time often expect clear skies, sunshine, and warm weather all year long, which is actually what you might find at any time. However, visitors aren't always prepared for the summer heat or the summer chill. In fact, at any given moment summer temperatures can vary 20 or more degrees Fahrenheit from the beach to the valleys, while winter ranges are less extreme. Additionally, when you look at the average high temperatures in Los Angeles, keep in mind that in summer, the average high temperature may last for a good portion of the day. In winter, L.A. may hit the high-temperature mid-afternoon for a few minutes before the mercury starts descending again. 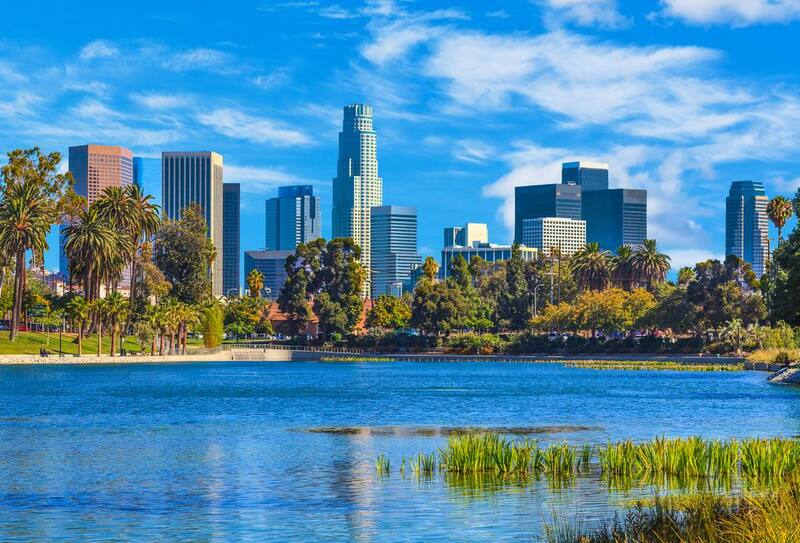 Los Angeles doesn't experience a traditional spring like many other destinations. Rather, spring temperatures are much more in-line with summer—or sometimes winter. Spring "cold snaps" can be interrupted by Santa Ana winds which cause an increase in temperatures overall. Winter and early spring are also among the wettest months in Los Angeles, but typically rains have ended by mid-May. Spring rains have an added benefit: They clear off much of the city's atmospheric haze and smog, which can make for great views from landmarks like the Griffith Observatory. What to Pack: Light-colored clothing is best on sunny days, regardless of the season. The sun is hot in winter and spring, even though the air is cold, so a dark jacket or even a long-sleeved black shirt can make you uncomfortably hot. It can be challenging to find a comfortable compromise when the sun is hot, and the breeze is cold. Summers in L.A. are warm and mostly dry. While temperatures might seem low—July averages just 72 degrees Fahrenheit (22 degrees Celsius)—this can vary significantly depending on where you are in the city. Locations near the ocean can be 10 or 20 degrees cooler than inland temperatures. Additionally, on sunny and hazy days, heat reflected off the pavement or sand can increase the temperature significantly. Even though the mercury may read 80 degrees Fahrenheit (27 degrees Celsius), it may feel more like 90 (32 C) if you’re on a walking tour of Hollywood or wandering around an amusement park. Skies are mostly sunny, except in early summer, when June Gloom—a cloud cover brought on by the Marine Layer—occurs. Occasional thunderstorms and high humidity also happen in the late summer. Los Angeles is also prone to Santa Ana conditions during the summer. This is when hot winds blow from the mountains all the way to the beach, bringing visibly lousy air quality and high fire danger. They also bring rare warm nights to the beach. The Santa Ana winds occur most often in late summer but can happen any time of year. What to Pack: Unlike other parts of the country where people pack their sweaters and jackets away at the first sign of summer, in LA, summer evenings are cool. Sidewalk cafes have outdoor heaters, but you’ll want to have that jacket along, even if you don’t go near the beach. Fall weather in Los Angeles is quite similar to spring, but this is the lead-up to the city's rainy season. Heavy rain is most common in winter and spring, but rain typically begins to increase by October. Days are still warm and mostly sunny, but at night the temperatures can drop considerably—lows in November can dip down to 50 degrees Fahrenheit (10 degrees Celsius). What to Pack: Even though this is L.A., it's easy to catch a chill on a fall night. Bring layers and a warm jacket. Although winter is the rainy season in L.A., it is also the clear season, compared to summers, which are dry but overcast, especially at the beaches. Winters can range from cool to warm and are usually the rainiest of L.A.'s seasons. Temperatures rarely drop below 40 degrees Fahrenheit (4 degrees Celsius), but a frost isn't completely unheard of, especially further inland. Santa Ana winds can also blow in during the winter. This phenomenon causes a significant increase in temperature, sometimes spiking temperatures as high as 95 degrees Fahrenheit (35 degrees Celsius). What to Pack: Pack clothing for layering, such as jeans, sweaters, and long-sleeve tops. You also won't want to forget a scarf or an umbrella. June Gloom is used to describe a phenomenon when the clouds from the ocean—called the marine layer—come inland over the beaches and sometimes all the way to the valleys. What the visitors' bureaus don’t like to admit is that in L.A. beach communities, June Gloom can start in May and last until September. Usually, in July and August the clouds burn off by noon, and the sun comes out at the beach. If you’re planning a summer morning at the beach, take a sweatshirt. What Is the Weather Like in Yosemite?